Salad for breakfast? Yes!! This Breakfast BLT Salad can be eaten anytime of the day really, but eggs and bacon served over this simple massaged kale salad with avocado and tomatoes is a delicious, savory, healthy breakfast idea. 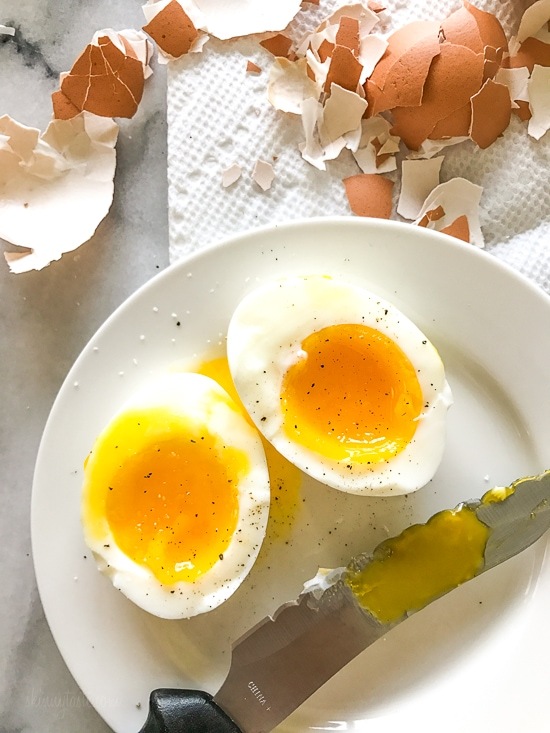 I’ve been making perfect soft boiled eggs in the instant pot, I shared the recipe last week, but hard boiled eggs would also work if you like a firm yolk. In a bowl combine the kale, olive oil, vinegar and 1/4 teaspoon salt. Massage with your hands for about 3 minutes, until the kale softens. Cook eggs to desired likeness, I prefer them soft boiled. How to Make Perfect Eggs in the Instant Pot. 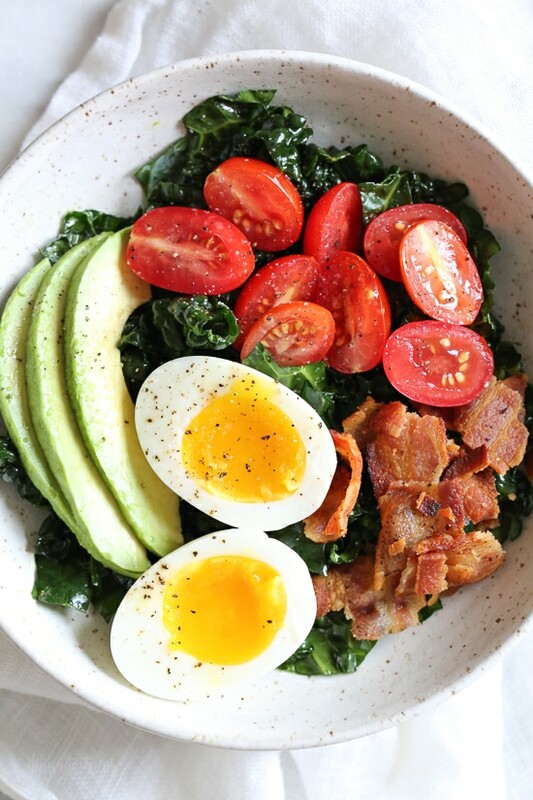 Divide the kale between two bowls, top with bacon, tomatoes, avocado and egg. Finish with pinch of salt and pepper. Thought I only liked kale as a cooked vegetable. I was wrong! Found Lacinato Kale at Whole Foods, massaged it per the recipe and loved it with the other ingredients! 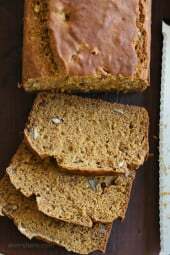 I’ve made this recipe about 4 times now – delicious! I even learned to make a pretty good soft-boiled egg which I’ve always liked but could never accomplish (my first attempt at this salad yielded hard boiled eggs but it was still good). 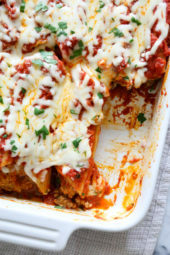 Someone shared this recipe with me and I’m glad she did! They say you eat with your eyes first, and this salad certainly proves that point!!! Colorful and mouthwatering!!! I truly enjoyed this BLT salad on a winters morning, thank you Gina for all your incredible recipes!!! This was so good! I used a baby kale mix and scrambled my egg. I used ready-to-eat bacon, which added a point. I feel like such a nutritional superstar when I have greens for breakfast. 🙂 I enjoyed this breakfast so much, and will definitely be making it again. I can also see how the same salad could be done for lunch, maybe swapping out the egg for chicken or some other 0 point option. It’s very versatile! How bad would it be if I didn’t use the egg or avacado? I also added an orange and cucumber to my salad. Came out great. And filling too. Didn’t have cherry tomatoes so I used one regular tomatoe. What a deicious way to eat kale! I wanted a low carb meal and this is perfect! I have never massaged kale and the directions made it so easy . First…thank you for putting out such a great resource of information. Love your site! I’m about to start my first Keto journey. (: I’m guessing the only reason this meal is not Keto friendly are the tomatoes, right? So, then if I remove them…I’m good. Seems too logical to even ask but, just making sure I’m not missing anything. Just started Leto and was looking for some variety for breakfast. This is a big winner-very delicious. I soft boiled the eggs for 5 mins in boiling water so they could be peeled but still very soft in center. This was the first time I peeled a soft boiled egg and there was no problem.. Will be putting this recipe in rotation. This looks delicious! It is not marked as Keto- friendly… any reason why not? Thanks! Every recipe I’ve tried I love. I’m looking forward to trying this one. Thanks for sharing! I haven’t had a recipe from you that we didn’t love! I really enjoyed this and loved starting my day off with so much green AND healthy fats! Oh and bacon, just can’t go wrong! I made this today for the first time…. and it is mind blowing delicious! Restaurants should serve this for weekend brunches! 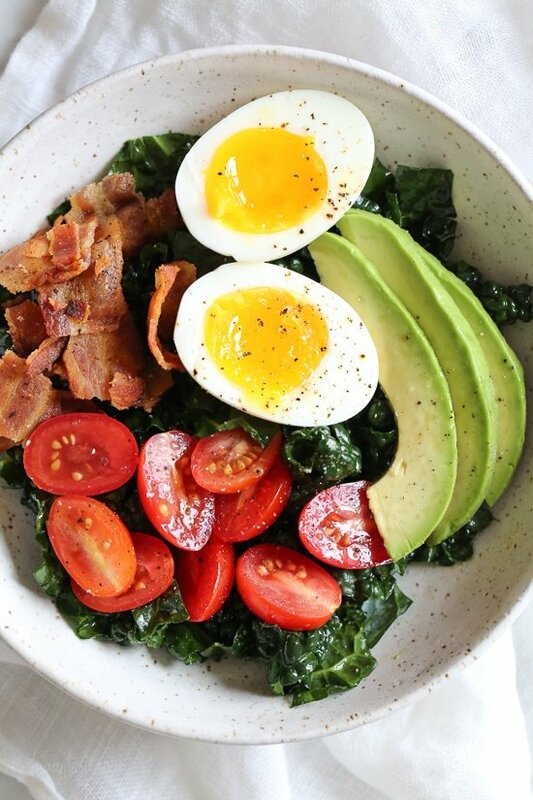 I usually feel like I need some carbs at breakfast post workout but this salad made me forget all about carbs 🙂 Thanks for a healthy, filling beautiful winning salad Gina! I made this for breakfast this weekend. So good! Even my grits and pancakes kinda guy loved it. I was surprised. By the way, obsessed with your books. Anything I’ve made, was tasty! Thanks Kristina! Glad everyone enjoyed it! Did you enter the recipe as 2 servings instead of one? I get 6SPs without the avocado in the app. This was amazing! Thank you! I actually made it it for dinner and we enjoyed every bite. Thank you for all your awe some recipes. I’ve been a quiet follower for many years now. This is currently my fav! Hello Gina, I’m new to your website and I find it very helpful thank you so much! One question can I prepare the kale salad a day before? my 12 yr old daughter requests this at least once a week for dinner! Do you have any thoughts on whether or not using avocado oil instead of olive oil would adversely affect the taste? 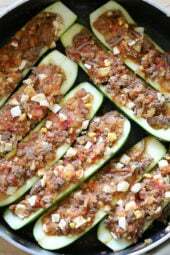 Wonderful & flavorful recipe. I changed it up a bit and used Canadian Bacon instead of traditional bacon. A bit less fat but equally as yummy! It means points plus, which was an earlier Weight Watchers point system. For some, smart points proved unsuccessful (i.e. being very hungry, losing very little, gaining) so they switched back to plus. I think because they are a large number of plus points users, or points +, she adds them to her recipes. I’m wondering how long the salad would keep in the fridge? I’m thinking of making enough for an entire work week but not sure if the kale would last that long? OMG! I can taste it!!! deliii! … I never know how to eat my Kale …. do you have more suggestions for it? I grow it in my garden! Thank you!!!!! Can u sub spinach for the kale. Im not a veggie lover but i will eat spinach. Thanks so much for all your hard work you put in these recipes for us. Do you think this would work well if made ahead? Can we use regular kale? We often can’t get certain veggies here in northern Wisconsin, thanks! What is a substitute for the eggs? I am not an egg eater. Quinoa is a great source of protein and would be great here. I had this for my breakfast today and I loved it. I always know if I’m following Gina’s recipe, it’s going to be delish! I did the plugged in the nutrition information provided and also tried plugging in the recipe ingredients in the WW calculator and I keep getting 9 Smartpoints. This looks delightful! Can’t wait to make it!! This I will try! Thank you! I’ve been doing this same thing for breakfast the last few weeks! The only difference is that I blanched the kale instead of massaging it with vinegar and oil. And used turkey bacon! It’s such a great way to get your vitamins and minerals for the day.